Table Tennis is a great activity to develop fine motor skills, quick reactions, and mental acuity! Players will develop the skills required to elevate their play to the next level. In our weekly classes and week-long camps, table tennis-specific footwork and strokework fundamentals will be emphasized. Instruction is available as weekly classes or week-long camps. 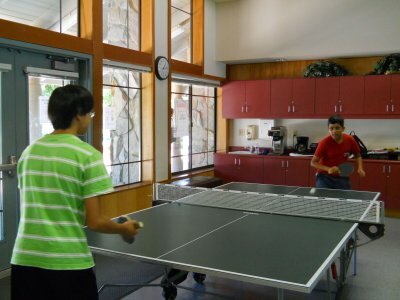 An action-packed table tennis class makes a nice addition to a weekly schedule. This type of regular practice is essential in building solid playing fundamentals. Our Lifetime Coaching Staff recommends training twice-a-week for accelerated development. All table tennis offerings integrate both training and rally elements. Basic paddles are available to borrow for class use. Appropriate athletic attire/footwear should be worn. Beginners will develop basic serve, forehand and backhand and techniques. Intermediate-level players will develop topspin/backspin/sidespin approaches for offensive and defensive play. Advanced-level players will perfect shot placement and patterns while improving the focus, touch, and range required to excel in competitive singles or doubles matches. The Ping Pong tables and equipment are available for rent in our club room. Each table rents for $7/hour per table. You can call and reserve 3 days in advance. You can rent 1 table for a maximum of 2 hours. You can rent 2 tables for a maximum of 1 hour. You can extend your reservation for a maximum of 30 minutes when nobody is waiting.